Where Are the 420-Friendly AirBnbs? Even when traveling to states where cannabis is legal for adult use, there are few to no places where you can legally consume the products themselves. Very few hotels will allow cannabis consumption of any kind on the premises, and you’re not legally able to consume in public. Luckily, those rules do not apply to private lodging options, like Airbnbs. Airbnb has no official policy on cannabis, leaving it up to the host to decide whether to allow cannabis consumption in their residence, so several progressively-minded hosts in cannabis-friendly states have chosen to make their homes and rooms 420-friendly. Some invite visitors to BYOC and either consume anywhere or in designated smoking areas, and in some cases, hosts will even offer a cannabis welcome kit that may include locally grown flowers, pipes, rolling papers, or other useful items. 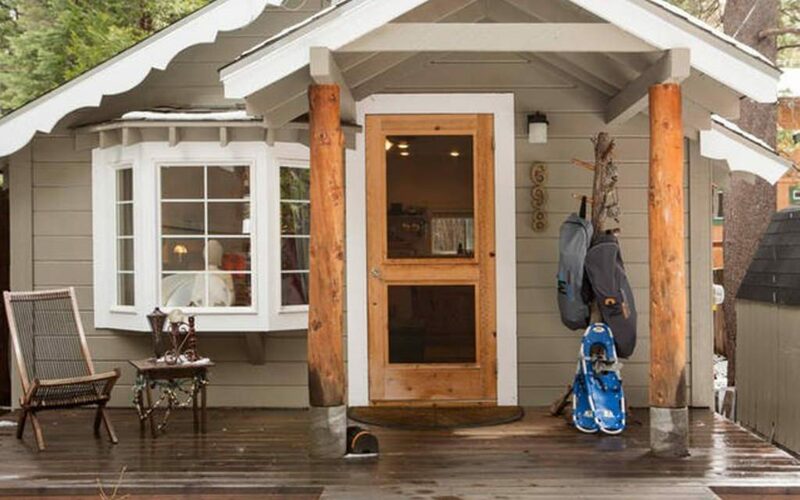 That said, these Airbnbs can be tough to find, thanks to the lack of a filter for 420-friendly listings on Airbnb’s site, so we’ve compiled a list of some favorite cannabis-friendly listings in Alaska, California, Colorado, Nevada, Oregon, Washington, and Washington DC. Love another cannabis-friendly Airbnb not listed below? Share it in the comments! Note: Prices listed may change over time. The seven cabins and one private cottage that make up Bowmans’ Bearcreek Lodge are situated on the Kenai Peninsula in Hope, a secluded town with a population of fewer than 200. It’s a woodsy getaway on the Turnagain Arm, meaning accessible water activities can include fishing, whale watching, rafting, and more. If you want to learn about the town’s history and the Turnagain Arm Goldrush, you can mosey over to the Hope & Sunrise Museum. Or, just hang around the lodge, where you’ll find a nightly campfire and a five-course dinner are included in the rental price. Bonus: There’s an ice cream truck on-site for when you get the munchies. 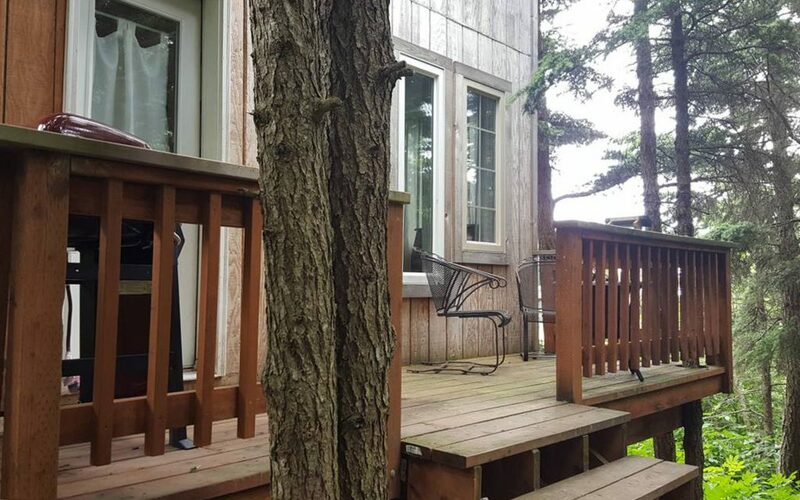 Doesn’t a cannabis-friendly forest hideaway in Anchorage sound like a dream? This cozy “treehouse” has amenities including a small kitchen, private deck, and a hot tub. Hiking and biking trails are located nearby, and guests can get to downtown Anchorage via a relatively short (for sprawling Anchorage) 35-minute drive. 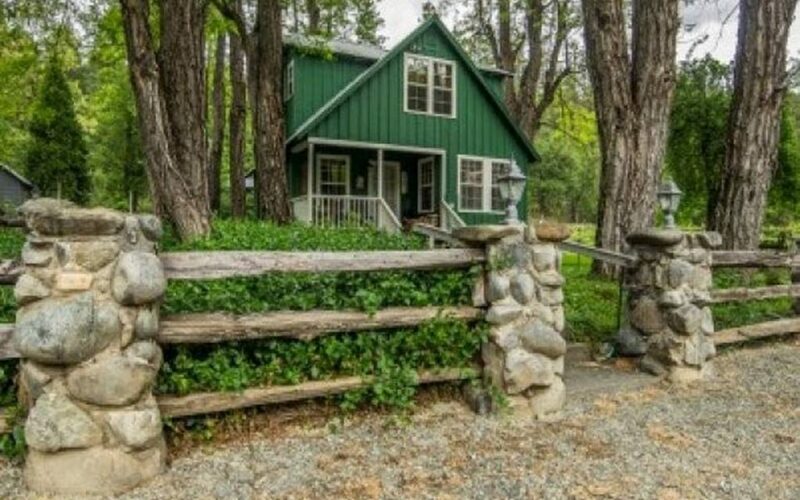 The Sweetleaf Retreat at Amador Wellness Cottage is a cute, 420-friendly option with free-range chickens and an amicable cat, where guests may book massages and spa sessions in advance. Described as a “cannabis-infused retreat,” the Sweetleaf package includes relaxing spa services for two people. Guests may enjoy a 90-minute massage with cannabis-infused oils and a salt scrub, as well as non-alcoholic THC or CBD drinks and the use of an infrared sauna. Operator Brandy LaRae says most guests arrive in the evening and unwind with a massage before resting up to explore the area’s wineries in the morning. Palm Springs is a perfect California vacation destination, less than an hour’s drive from Joshua Tree National Park. 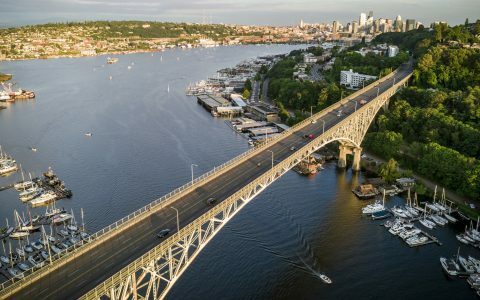 It’s known for midcentury modern architecture, and a fun downtown area with numerous bars and restaurants. 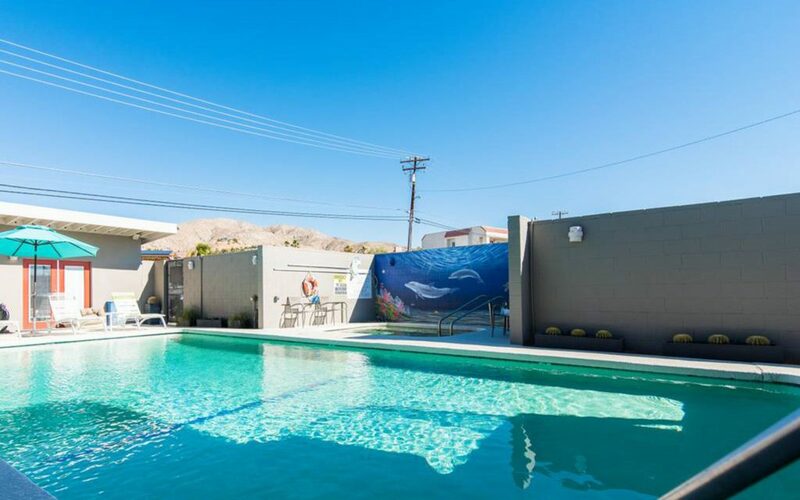 There, you’ll find Desert Hot Springs Inn, a small six-room hotel with amenities including a pool and hot tub. 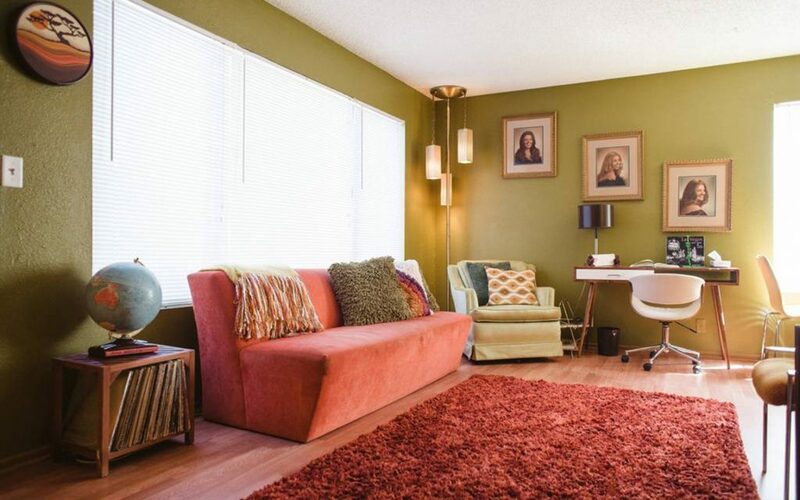 Bright colors, fun furnishings and a 420-friendly policy make it a great home base for exploring the area. The mini-resort also has an on-site massage therapist, and pets are allowed. Northern California’s Feeling Groovy at Eagle Creek Ranch is a cannabis-friendly destination located in the mountains of Trinity Center. Activities on the ranch may include farm-to-table meals, yoga, guided horseback rides, a walk among sheep, biking, and more. 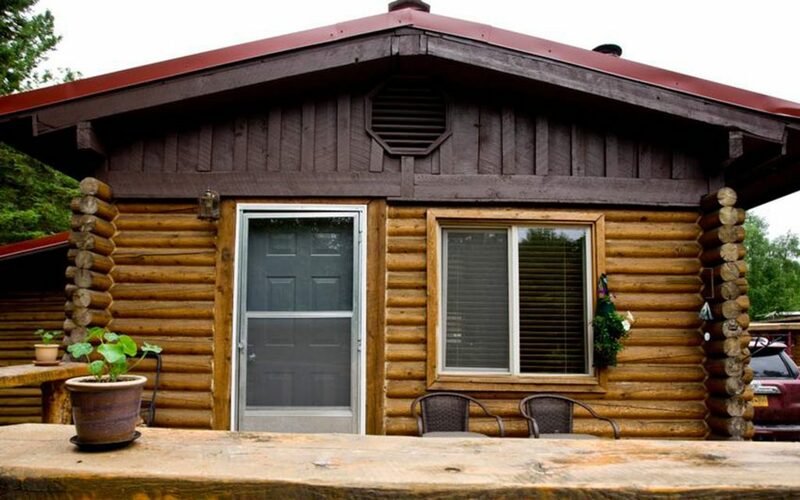 The ranch has a picturesque cabin feel with gorgeous grounds, and cannabis smoking is allowed in designated areas. 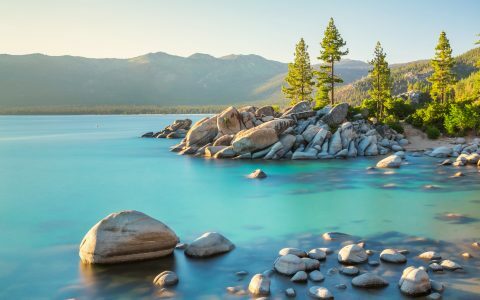 South Lake Tahoe is right near the California-Nevada border. 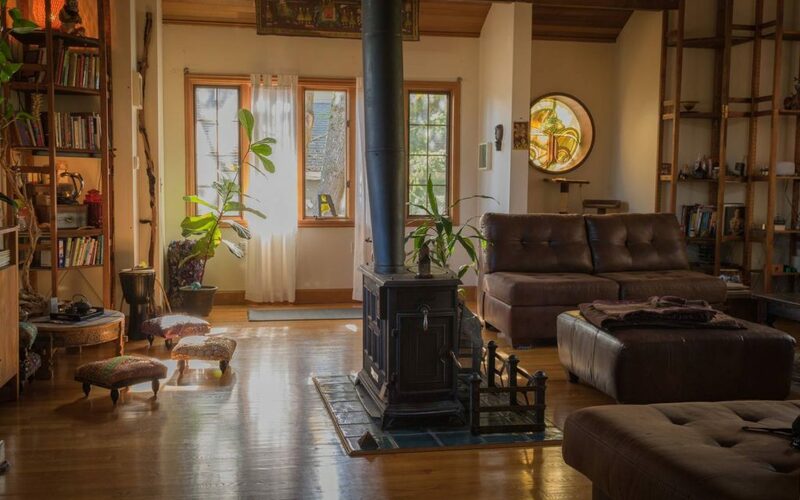 This Airbnb offering is described as a “vegan bed, bud, brew, and breakfast,” where guests can enjoy the scenic beauty of the surrounding lakes and mountains in the comfort of a cozy private cabin. A vegan-only kitchen offers healthy breakfast items, coffee, tea, kombucha, and snacks, and guests also receive locally grown cannabis and local beer via South Lake Brewing Company. 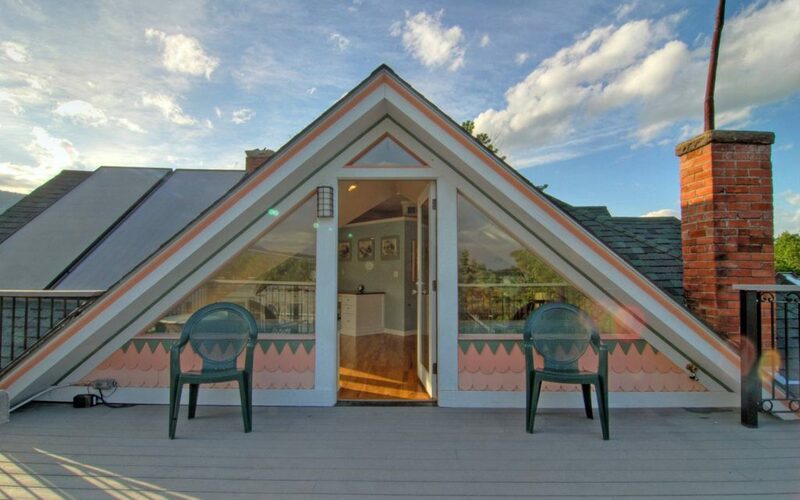 This charming, 1000-square-foot penthouse in downtown Boulder offers mountains views, and it’s only a block’s walk to the closest dispensary. Guests can hang out in the penthouse, where the slanted walls provide homey comfort and the large triangular windows let in plenty of sunshine, or take a toke out on the private patio. 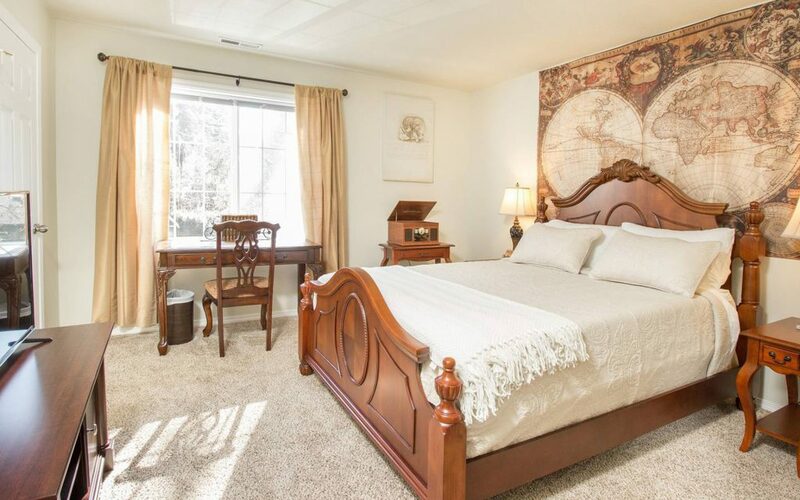 A king-sized bed, full bath, and kitchen mean you could stay in for a long weekend or artist’s retreat, or you can go for nearby dinner or drinks as you explore the always-charming city of Boulder. 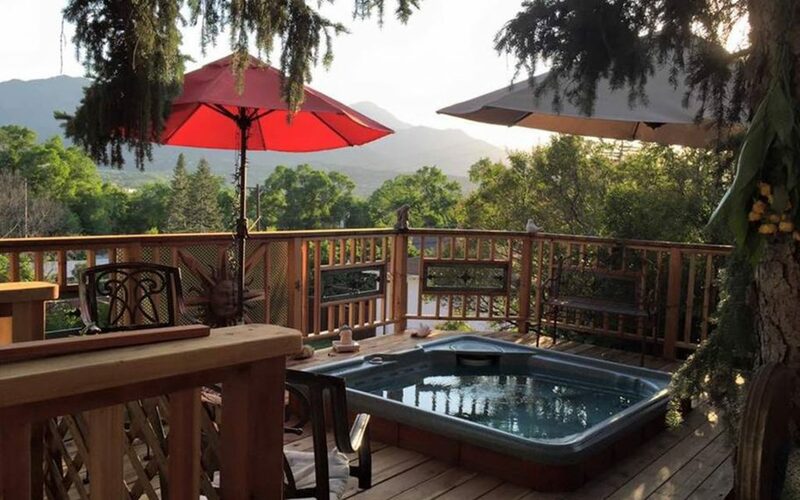 You know you’re in for a treat when a rental’s title is “Mystic Portal.” Located in Colorado Springs, this secluded, cannabis-friendly B&B features plenty of outdoor space, and long as you’re quiet, you can access the hot tub or kitchen 24 hours a day. There are a few room options here: The Treehouse Room, in particular, is rustic and charming, with lots of natural light and mountain views, while there’s another bed outside allowing for sleeping beneath the stars. There’s even a relaxing pond with fish where you can have a serene meditation session, accompanied by your strain of choice. 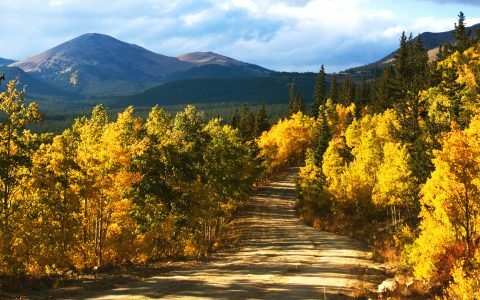 According to the listing, this bud and breakfast in Silverthorne allows for “Colorado’s two most enjoyable and unique attractions: world-class skiing and legal cannabis.” Each morning, Wake-and-Bake includes coffee, breakfast, and perhaps an uplifting sativa strain; at 4:20 p.m., they have a happy hour including hors d’oeuvres, beer, wine, and more cannabis. There’s also a hot tub, fireplace, and massage studio on property. 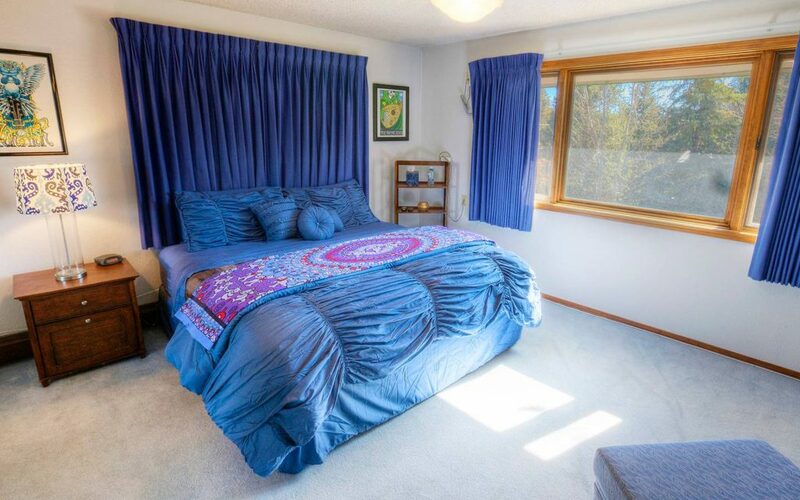 Guests may elect to rent out the whole house or just a room, like, perhaps, their Jerry Garcia suite, done up in pretty, psychedelic blues. 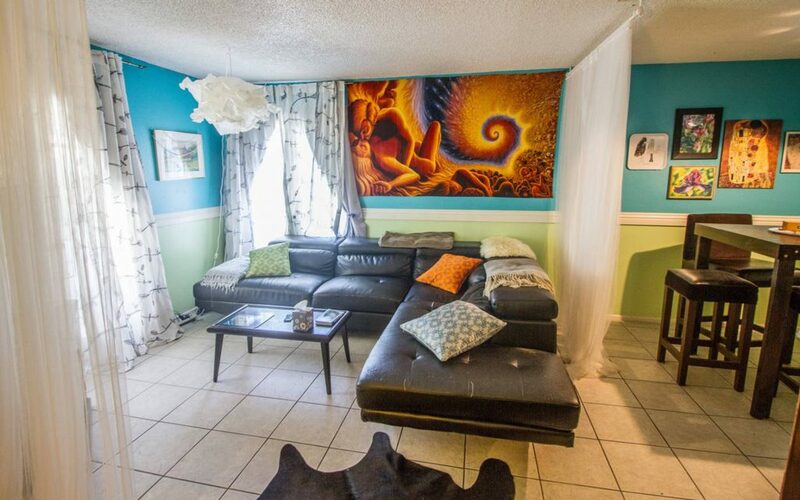 This Vegas rental went with a hippie throwback theme, and cannabis use is “totally okay.” You’ll have the whole place to yourself, which includes a kitchen and Wi-Fi, and it’s located near Vegas’s Arts District and a short drive from the Strip. Fun artwork, records, a shag rug, and quirky décor make this a suitable place to relax in between binging on all Sin City has to offer. This lively two-bed condo in Las Vegas features a full kitchen, massage chair, a big TV, a minibar, and lots of artwork. It’s 420-friendly, and located in a quiet neighborhood tucked away (but not too far) from the bustle of the Strip. It’s a comfortable home-away-from-home for those who’d prefer a more serene place to crash than a densely populated Vegas hotel-casino. Tender Bud Acres is located on a farm in Hubbard, near Mount Hood. 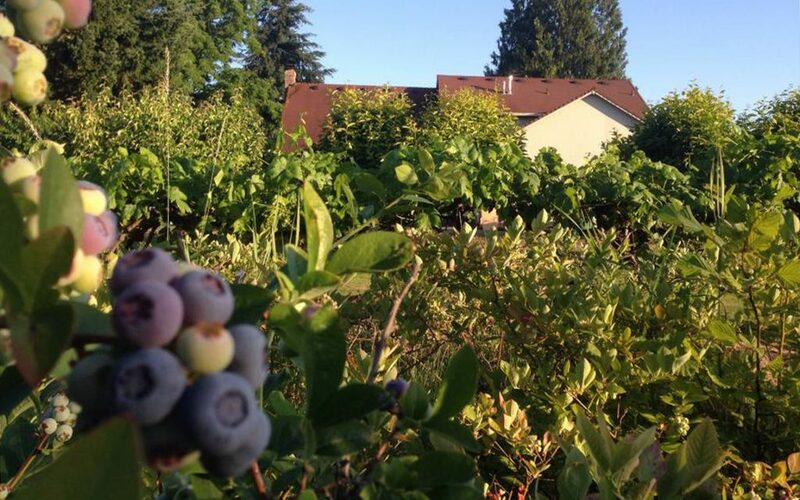 You can walk the property’s five acres (where you may encounter dogs, cats, or chickens), or pick blueberries from the patch. Breakfast is made with locally sourced products, including eggs from the aforementioned chickens. 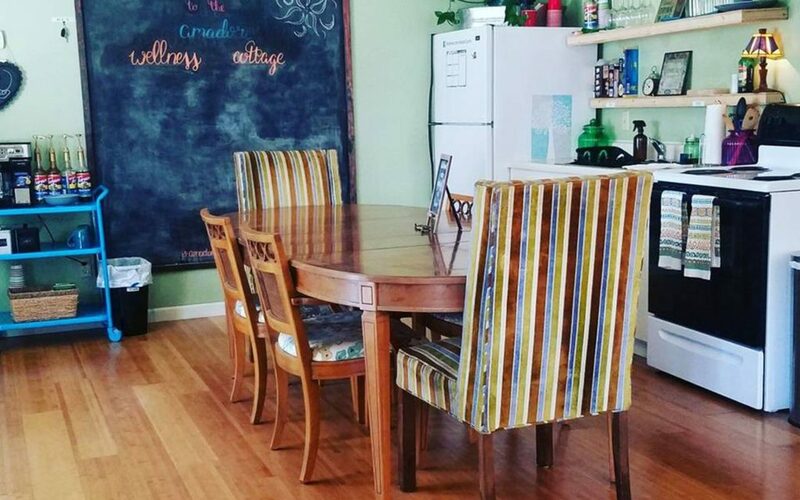 There’s a kitchen and fire pit, and if the hosts happen to be offering an art, cooking, or gardening class during your stay, you’re free to drop in. There’s no smoking allowed in the rooms, but you may smoke or vape outside, and a hookah and other paraphernalia is available should you forget your own. Taking up the entire second floor of a cottage in Portland’s Eastmoreland neighborhood, this space is a tidy, airy option with art, beautiful furnishings, TV, Roku, and a kitchenette stocked with coffee, tea, and popcorn. 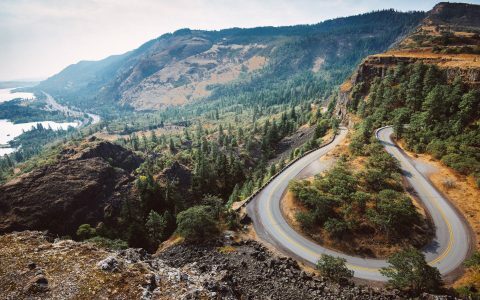 All guests can also make use of an acoustic guitar, record players, and the hosts’ vinyl collection; guests who are 21 or older can enjoy a complimentary box stocked with cannabis accoutrements including rolling papers, a grinder, a lighter, and an ashtray, plus a list of favorite local dispensaries. 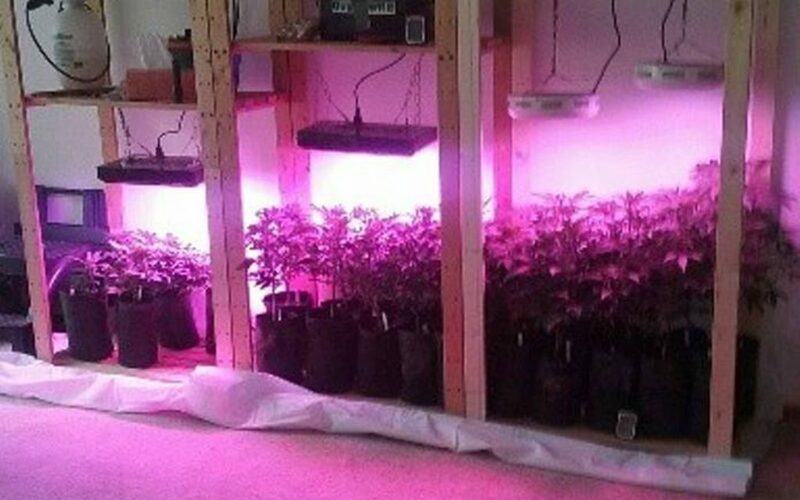 The Delta-9 House is made for cannabis consumers, with two available rooms named Indica and Sativa. Amenities include TV, video games, a full kitchen, a fireplace, laundry, workout equipment, and a home office. 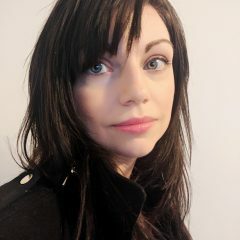 The hosts record a podcast called the Marijuana Agenda on weekdays at 3 p.m., which guests are invited to watch if they so choose. As far as the cannabis usage goes, they supply pretty much anything one could want, and are within a short walk from two dispensaries. Breakfast is included, and the eggs are provided by chickens that live on the property. 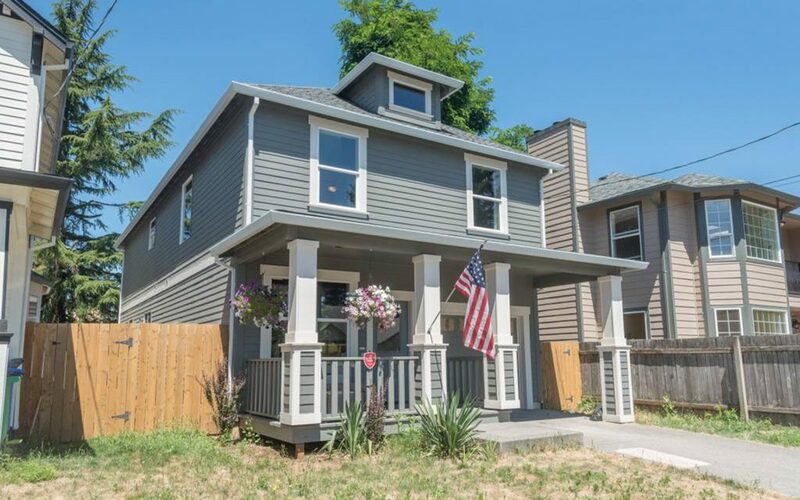 This cannabis-friendly cottage in Seattle’s Ballard neighborhood is incredibly charming. 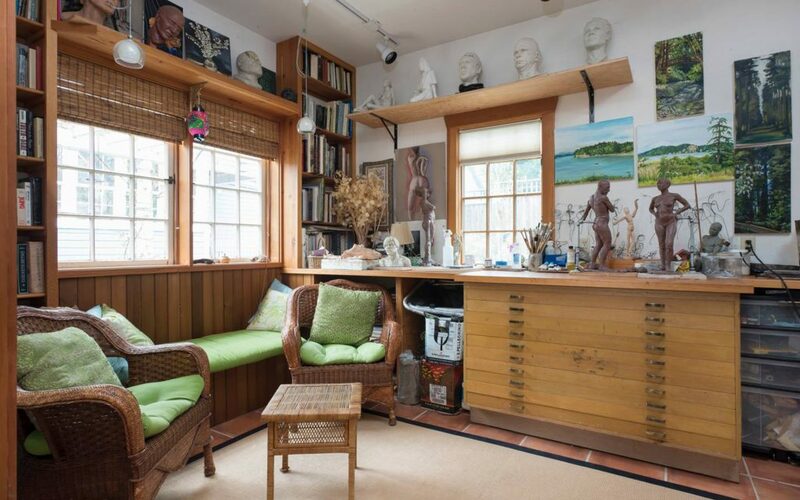 It’s tucked behind a Victorian house, and is used as an artists’ studio when there are no tenants, so it’s full of beautiful pieces. The patio and English Garden would be a perfect place to light up or vape, perhaps before or after a short, leisurely stroll to the curated shops, dispensaries, and cafés of downtown Ballard. Big Hat Farm is a legal cannabis farm located in Morton, Washington offering a truly unique experience: Guests 21 and older can book their bed and breakfast or campsites, and experience what it’s like to live and work on such a farm. 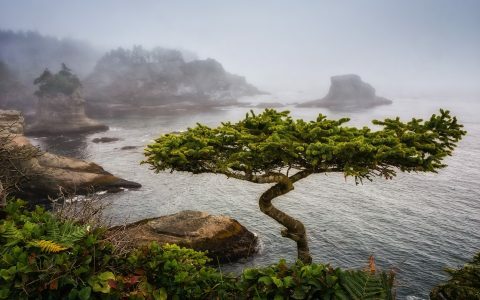 Depending on the season, this may mean watering and pruning plants or processing the buds; additional activities may include stargazing, relaxing around a fire pit, gold panning in the property’s creek, hiking, and nature walks. Guests are not allowed to leave the property with any cannabis, but are free to partake from the farm’s wares on-site. 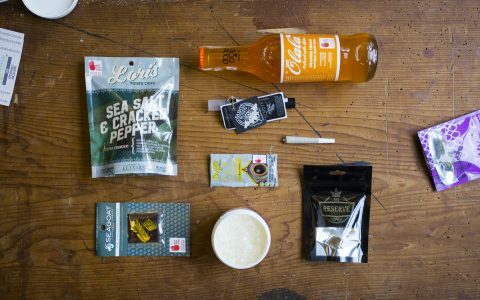 A variety of paraphernalia are available and free to use for sampling the product. Seattle’s Winston House offers a relaxing getaway, where guests are encouraged to both unwind and get creative. Bongs, pipes, and rolling papers are provided alongside art supplies and organic coffee. Guests can enjoy a campfire in the backyard, a salt water hot tub, yoga, and plenty of outdoor and community space. The house itself is truly beautiful, with hardwood floors, lots of sunlight, and a variety of artifacts to respectfully explore. 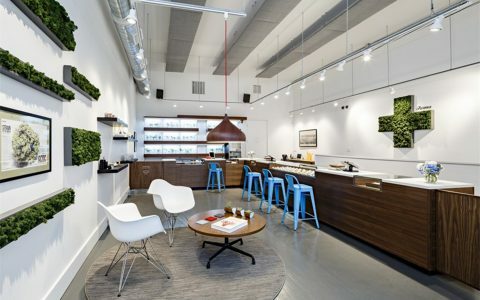 DC Cannastay is located near Rock Creek Park in DC, offering a 420-friendly place to stay that includes free cannabis flower and edibles to sample. 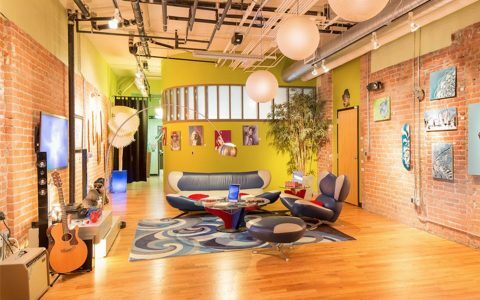 The space is covered in art, with colorful murals from local artists spanning the walls, and includes a full kitchen. 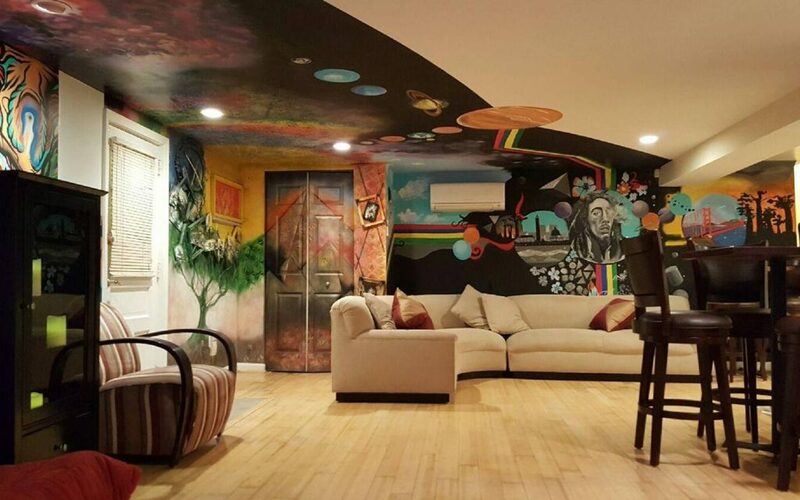 It’s also one of the rare listings that allows cannabis smoking indoors.